The unique Astro 320 dog tracking system pinpoints your dog's position and shows you exactly where he is on a vivid color screen, even when you can’t see or hear him. The Astro system has features that hunters have been asking for – like increased range and battery life, more durable antenna, a simplified user interface and must-have mapping capability. The Astro system includes the Astro 320 handheld and the rugged DC™ 50 transmitter collar¹ with an orange polyurethane strap (accessory color straps sold separately). DC 50 features top mounted GPS and GLONASS receivers and a newly-redesigned steel VHF antenna. Switching to rescue mode reduces the refresh rate in order to preserve battery life, giving you more time to look for a lost dog. Plus, Collar Lock creates a 4-digit PIN number that helps prevent others from seeing your dog’s whereabouts — a useful feature in field trials to ensure that an Astro is used only as a recovery tool when a dog in competition becomes lost. Bark Detection lets you know your dog is barking even if it’s out of audible range, a crucial feature for treeing hounds or running hounds that cover a lot of ground, even in heavy cover. The intuitive and easy-to-use Astro system takes dog tracking to an entirely new level with new software for the 320 which supports the DC 50 dog device and adds new features such as bark detection. The interface streamlines what is displayed by allowing dogs that are outside the current zoom level to have their location notated in the display’s margin. The user also can choose the amount of each dog’s tracklog displayed, or toggle it off completely, to avoid cluttering the map. The Astro 320, compatible with any Garmin DC series transmitter, also debuts innovative features like enhanced map drawing capabilities, BirdsEye Satellite Imagery compatibility (subscription required), vibration-based alerts and a 3-axis electronic compass. Both durable and waterproof, the Astro 320 system features the legendary toughness that’s built to withstand the elements – whether it’s dust, dirt, humidity or water, nothing is a match for this essential hunting companion. With its microSD™ card slot, Astro 320 lets you purchase and load TOPO U.S. 24K maps for land elevation contours or City Navigator NT® map data for turn-by-turn routing on roads. Astro 320 also supports BirdsEye Satellite Imagery (subscription required), that lets you download satellite images to your device and integrate them with your maps. Mapping depicts important nearby geographical features – and lets hunters know, for example, if their dog has crossed a creek or is nearing a dangerous road. In addition, Astro 320 is compatible with Garmin Custom Maps, free software that transforms paper and electronic maps into downloadable maps for your device. As often as every 5 seconds, your dog’s DC 50 transmits his position to your handheld, and you can see his current location and a trail of where he’s been on the map page of your handheld. Switch over to the Dog Tracker page to view a compass pointing to your dog’s location as well as his current status: whether he’s running, sitting, on point or treeing quarry. Astro also can let you know when your dog is barking, even if he’s out of audible range..
Each dog’s precise distance also can be presented on the map page, and users can choose an option that auto zooms the map so all dogs can be seen on the display at any time. Alternately, dogs that are too far away to fit on the map’s current zoom scale can be notated on the display’s margin in the direction of the dog’s location. The user also can choose the duration that each dog’s tracklog is viewed on the display – or toggle it off completely for a cleaner display. 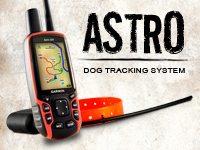 Astro boasts a high-sensitivity GPS and GLONASS receiver which is mounted to the top of the collar so that can track your dog’s position even in heavy tree cover or deep canyons. You can track up to 10 dogs at one time with Astro, from up to 9 mi away (depending on terrain). The system transmits information by line-of-sight, so it reaches farthest in flat, open territory. After you’ve captured your quarry, mark the exact spot with Astro’s Covey Counter™, a special waypoint that tells you the exact location, time of day and elevation where you found your prey, as well as the number of birds you flushed and took from that location. Astro lets you save other special waypoints, such as "Truck" and "Lodge," so you can save the location of these places quickly and easily for each hunt. Astro also offers special waypoint icons to represent food plots, tree stands and other hunting-related points. The all-new BaseStation lets you turn your laptop (loaded with BaseCamp) into a field control center for tracking multiple dogs (additional DC 50 collar units required). 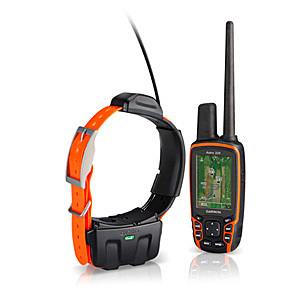 View real-time GPS/GLONASS information on the larger display of your computer, making it ideal for canine search and rescue teams. And because it’s Garmin GPS-based, safer, more effective tracking is possible, even where Internet and cell phone service isn’t. ¹The DC 50 is compatible with the Astro 320 handheld only (software upgrade required). It does not work with Astro 220 or Alpha™ handhelds. Due to varying international regulations, this version of the Astro is approved for use only in the U.S. The sale and unlicensed use of the Garmin Astro GPS dog tracking system in any form is presently prohibited by the Canadian government. According to a document published by Industry Canada dated June 2009, the MURS radio frequency used by the Astro will be permitted to be sold and operated on a license-free basis at the end of a 5-year transition period (June 2014). This Industry Canada ruling may be found in its entirety at http://www.ic.gc.ca/eic/site/smt-gst.nsf/eng/sf09543.html. Parties interested in the implementation of this spectrum utilization policy or with questions should contact their local Industry Canada office. Tracking man's best friend has never been so easy. WIth the 320, you can choose to see a combination of your dog's name, direction, distance and status so you can see everything without leaving your map. Your dog covers some serious ground, but you don't need to. Stay focused on where you're going, while keeping up-to-date on your dog, even when he or she has gone off screen. Need to share your dog with a pal? No worry. Wirelessly send, receive or transfer a dog's name, ID and update rate between units. You can track up to 10 dogs at a time, at a distance of up to 9 mi away (depending on the terrain). Keep track of what you did, when you did it, with Astro's improved calendar. It automatically and conveniently links all of your marked points and logged tracks to the day of the hunt for later review, or bragging rights. Bigger and bolder, the 320 uses larger icons and text so you can find what you're looking for faster. Plus, the interface streamlines what is displayed by allowing dogs that are outside the current zoom level to have their location notated in the display’s margin. You can purchase the Astro 320 in a bundle or as a stand alone receiver. 010-11484-00 DC 40 GPS Dog Tracking Collar Transmitter No Longer Available. 010-11314-50 TOPO U.S. 24K West DVD No Longer Available. 010-10469-00 TOPO Canada DVD No Longer Available. 010-C1053-00 TOPO Israel No Longer Available.